Resorts and bungalows are Bang Bao Beach (Klong Goi) are slowly but surely increasing in number as the measured development of the area continues. You will find something to suit all budgets, from cheap backpacker rooms through more standard bungalows and up to the pricier boutique resorts at Chivapuri Beach Resort, Chaipura Resort and Tropical Beach Resort. With the sea no more than 7 minutes walk from the furthest rooms, this area is ideal for a proper beach holiday – peaceful and laid back for couples who want to escape for a few days but good for families too with nice shallow safe waters and a few activities like kayaking and Stand-Up Paddling to keep the kids busy. There are good value beach restaurants all along the sand and even one or two bars for the evenings. Bang Bao Beach does fill up during the day with people coming over from Bailan Beach, Bang Bao and Lonely Beach. The area also sits at the end of the line on the west coast of Koh Chang, so having your your own transport makes life a lot easier. Without it, you are vulnerable to the capricious whims of those taxi drivers and their rate cards. Chivapuri Beach Resort offers large Lanna style villas with a swimming pool at the southern end of the beach, rates start at 3,500bt and rise to 8,500bt for a family room. Next door,Tropical Beach Resort has that brushed concrete style with good value bungalows at 2,500bt. Back past the bridge on the creek, Chaipura Resort offers something a bit different with large houses spilling down the slopes towards the water. It’s just a two minute walk to the sand, rooms from 2,500bt with a new set ready for this season. Huge beachfront villas, garden, deluxe, and sea view rooms at this small luxury resort nestled in the trees and on the beach towards the southern end. Swimming pool, restaurant, massage, kayaks. Brushed concrete stylish villas with thatch roofs, a/c and bathroom ensuite, situated either on the beach or back in the trees at the southern end. Restaurant, boat trips, kayaks. After the bridge to the beach on the creek at the northern end, 9 luxurious large a/c cabins dotted up the slope with views over the water. Teak wood restaurant, boat trips, kayaks and free transfers from the ferry pier at Ao Sapparot. At the the top end near the bridge, The Beach, with its restaurant by the sea, has a small selection of rooms at the back, a/c with hot water at 1,000bt to 1,500bt. Alongside, Yu Yu Golden Beach, same set-up of restaurant and deck chairs by the sea, has a much wider variety of brightly painted green rooms, including a new row which look out onto the creek and across to Chaipura Resort on the other side. The lowest budget fan rooms are 400bt and the suites at 1,200bt. Further down, Sea Paradise, home to Stand Up Paddling, has just three rooms behind, prices at 1,500bt a night. 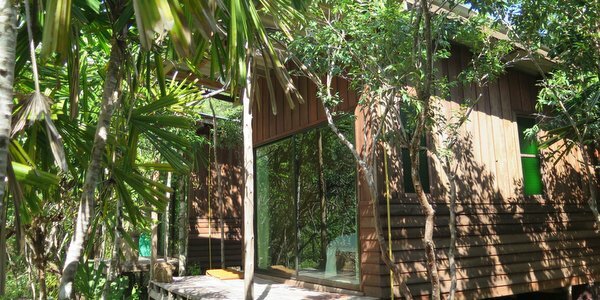 Klong Kloi Cottage in the centre of the beach is a local favourite with simple cute huts from 400bt for fan and bathroom, with plenty more styles, more expensive, in the trees at the back. Next door, the long established Bang Bao Beach Resort has mostly a/c rooms at 1,700bt to 2,500bt. On the tracks behind the beach, things are also now beginning to fill in. Follow Yu Yu’s bungalows to the end of its new row on the creek and shortly after you hit the Welsh run Lakchai Resort, 6 or so bungalows at 700bt per night, with restaurant also by the water. Nearby, other bungalows include Sea You Place from 500bt a night and hidden away right in the mangroves, Freedom Home, prices at 300bt for fan room. 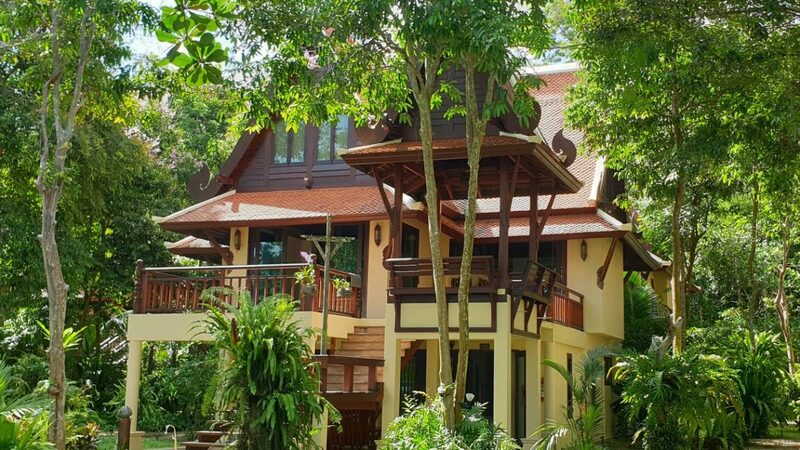 On the main trail which leads all the way to the main road at the back of Bang Bao Beach, Yak Bungalows, Treehouse Cottages, Santisook Bungalows and T Garden Resort are other choices, with all firmly aimed at and priced for the traveller and backpacker on a budget. At the far end end of the bay, Koh Chang Boat Chalet, the latest name for what was formerly Grand Lagoon and then Aunchaleena Bachfront Resort, used to attract Russia and Chinese tour groups, but they have dropped away considerably to leave a fabulously surreal resort folly. It is tantalisingly close to being very very hip without knowing it. A/c double bed bungalows with ensuite bathrooms, single and double fan huts and rooms with shared bathroom. Restaurant and deckchairs. Just steps from the sand or on the creek. Bungalows and huts, a/c or fan, in a prime location just off the sand. Restaurant, WiFi and friendly chilled-out atmosphere. Good evening bbq. Mixture of Superior glass fronted bungalows and older wooden bungalows, a/c and fan, next door to Klong Koi Cottage in the middle of the beach. Restaurant, great location on the sand. Very relaxed. On the back trails near the creek, nice set of fan or a/c bungalows in a garden setting. Bar, cooking facilities, laundry. 5 minutes walk to the sand. 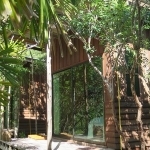 On the small island in the creek, 20 or so bungalows, a/c with glass fronts and bathroom, simple wooden huts with fan and shared bathroom, all joined together by wooden walkways. Lounge area. Ting Tong Bar owned, not connected to other Treehouse in Long Beach. There are now a couple of places to stay on or near Hat Sai Noi Beach, which is about a kilometre before Bang Bao Beach (Klong Goi) proper. Rasta Beach offers basic bungalows in reggae colours hidden away on the coast just after Tranquillity Bay, rates as low as 150bt. Secret Garden, is a whole house on the rocks next door at 3,000bt a night sleeping 5 and Karma also have their own cheap accommdation alongside their popular hippie bar. 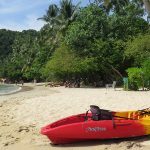 On Hat Sai Noi Beach itself, there are rooms available next door to Ido Ido Bar, but Indie Beach is the pick of the bunch with its charming set of cottages built up the slope. On the stretch of coast by Tranquillity Bay, basic fan bungalows or rooms down on the rocks. Restaurant up at street level with magnificent views over Bang Bao Bay. 5 minutes walk to the beach. Handful of nicely designed small fan ensuite cottages and one larger house on the beach at Hat Sai Noi. Cafe, other restaurants, right on the beach with the sea just steps away. Tiny backpacker hangout of basic fan rooms at the end of the track, bar area, food, Wifi, very laid back and relaxing. Another small backpacker haunt by the trail – fan bungalows with bathrooms ensuite, Bar, can cook, WiFi, chill out area, hippie vibe. On the main track, 8 woodem style thatch roof fan bungalows, restaurant for breakfast and drinks, coffee/tea. 5 minutes walk to the beach. At the end of the main trach leading away from the beach, 9 a/c or fan bungalows, small seating area for drinks, coffee/tea. No restaurant. 7 minutes walk to the beach. Large fading, almost ghostly resort, with standard bungalows, villas, a 7 storey ship hotel (now closed) and floating boat villas. Restaurants and bar, listing ship swimming pool. At the far end of the bay. Charges 100bt to walk around for outside guests.